President Mark B. Rosenberg sent the following message to the university community on Friday, Jan. 12. Watch his full remarks at the Martin Luther King Jr. commemorative breakfast below. Yesterday, Washington hit a low point with respect to our neighbors and friends, including those from Haiti and El Salvador. We regret this. That is not how we think. This is not who we are. This is not who we aspire to be. I, personally, am disgusted by the senseless words coming from our senior-most leader. Our diverse international community is at the core of who we are, the core of our institutional and our community’s ethos. At our FIU, we have a tradition of diversity. International is our middle name. We embrace people. We embrace ideas. We embrace traditions from all over the world. They make us stronger. They make us better. They align us more with Dr. King; who we trust, who guides us. Today and every day, indeed we have an opportunity to honor his legacy and his memory. Dr. King is a great American. He stood up against ignorance. He stood up against disrespect. He stood against racism. And let each of us draw strength from that and be beacons of light and inclusion in our community, our nation and the world. We have to speak up when nasty things happen like yesterday – unacceptable – in terms of who we are and who we aspire to be. Today, as many of you know, also marks the eighth anniversary of the earthquake that devastated Haiti and forever changed the lives of so many of our friends and our neighbors. So if we could just take a moment of silence for the thousands of lives that were lost that January afternoon and the days that followed. Please click here for a video of the full remarks from this morning’s breakfast. Wonderful speech by Dr. Mark Rosenberg. Thank you for being strong and direct, rejecting the lows of a selfish leader in Washington DC. Thank you for interpreting in a most positive way the directives of MLK, making them current and alive in our community, in our state, and internationally. Today, I am especially proud of my FIU degree and continuous affiliation through our Alumni Association. 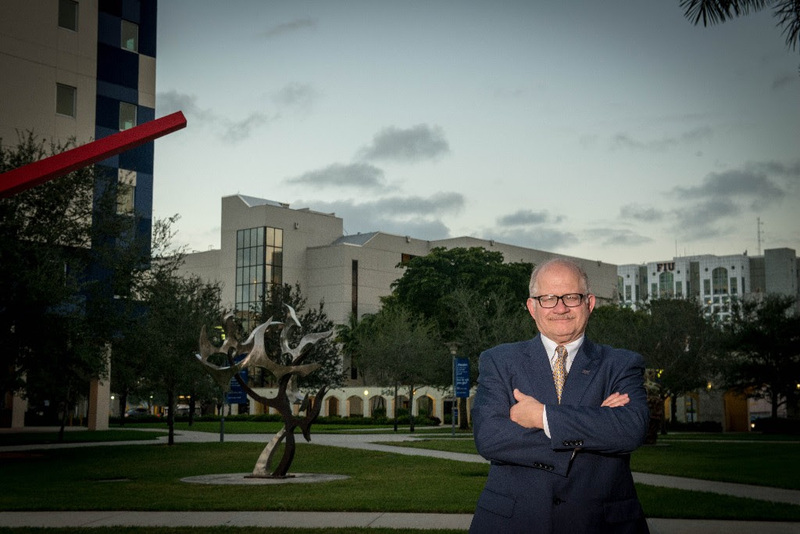 With relatively few words, our President Rosenberg has clearly reminded us all of the righteous quest for social equality and human respect that FIU has stood strongly for since Day 1 of its founding. Well done, Sir! Paws UP! Thank you Dr. Rosenberg for your leadership at FIU. Being so proud of FIU! Thanks Dr. Rosenberg for being so strong and direct. Making this international community positive and collaborative is what everybody would like to see. I’m proud of FIU. Thank you for speaking the truth. Trump does not represent America. He may be well-intentioned, but is completely missing the mark when it comes to preserving our value system. We may have a booming economy, but we CANNOT trade values for money. We cannot give up our rights to think differently and we must preserve our foundation as a country of immigrants. Folks, we CAN have a great economy without threats to the values that make American great. Don’t let Trump let you assume otherwise.